Which Dean will be crowned the Elite Circuit Series champion in Preston on Sunday? Dean Downing goes into the final round of the competition 31 points ahead of namesake – and Rapha-Condor-Sharp team-mate – Dean Windsor, with 60 points on offer for the victory. Downing has finished in the top two at the previous four races, and his consistency should be enough for him to take the title, which he won previously in 2009. Newly-crowned National Circuit Champion Graham Briggs, who will wear his white, blue and red jersey for the first time, may not be able to win the series, but will hope to wrap up third in the standings. Rapha’s dominance is highlighted by the fact that fourth placed rider, Sigma Sport-Specialized’s Tom Murray, is over 100 points behind Downing. Downing celebrates Briggs’ victory in the National Circuit Champs – will the roles be reversed on Sunday? 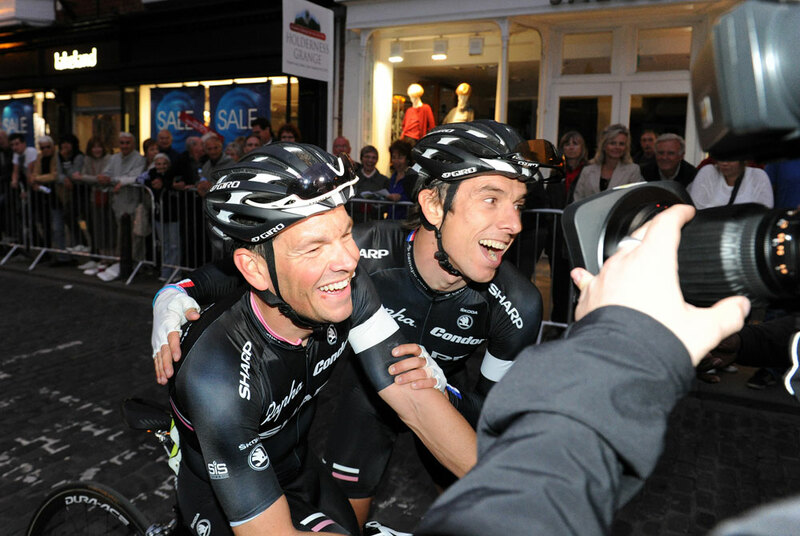 Having already won this year’s Tour Series title, Rapha have dominated this series, taking a one-two-four at the Stafford GP, a one-two-three-five in Abergavenny before Ed Clancy led home a one-four in Colne a week later. This week has already been a success for John Herety’s team, as Dan Craven took an impressive solo victory in the first of two mountain stages in the Vuelta Ciclista A Leon. Craven rode alone for the final 40km, and won by two minutes at the finish in Torre del Bierzo. Motorpoint’s Ian Bibby took fifth on the stage. Craven leads the race with two days of racing left, team-mate Jon Tiernan Locke is in third. Hours before the men take to the streets of Preston, the Lancashire city will host the National Women’s Circuit Race Championships. 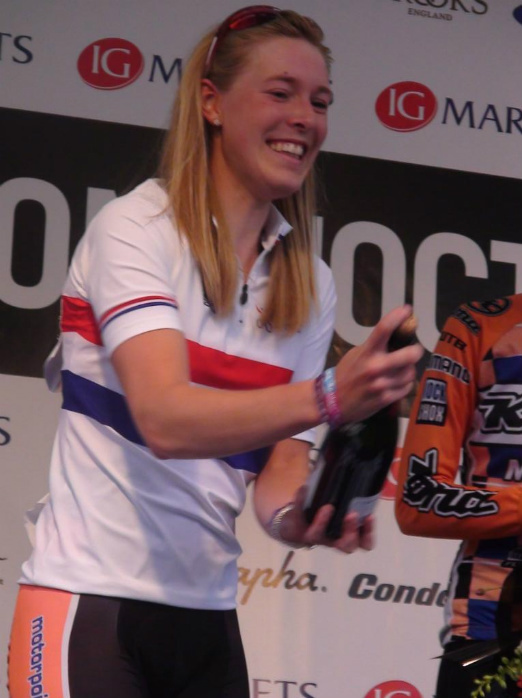 Defending champion Hannah Barnes will lead a strong Motorpoint team, with Tour Series runner-up Lucy Garner, Harriet Owen and Hannah Walker all riding. Competition is likely to come from Dani King (Horizon Fitness), who proved her form in last week’s U23 European Track Championships in Portugal. Her fellow Horizon colleague Hannah Rich is worth watching, having spent most of the last two months racing abroad in events such as the Thüringen Rundfahrt stage race in Germany and the Tour de Feminin. The women’s race begins at 12pm, with the men scheduled to start at 1.30pm. 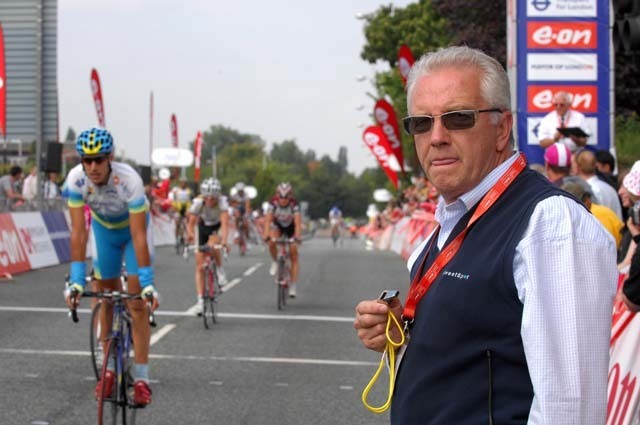 Want to help at the Tour of Britain? Cycling enthusiasts are being invited to once again volunteer to be a part of this year’s Tour of Britain (September 11-18). Each year, the Tour relies on an army of 1,000 helpers across the event, and already several hundred people have put their names forward via the race’s website. Today sees the official launch of the drive to recruit the volunteers, and notably around 500 alone are needed for the final day TfL London stage, which will take place around Westminster. Volunteers will receive a goody bag containing items from the race and its suppliers and sponsors. To apply, visit the Tour’s official website, click on the volunteer tab and complete the form.